Jacob wool wins the Black Sheep Cup! I love that I got to share this moment with my husband, son, and numerous friends. 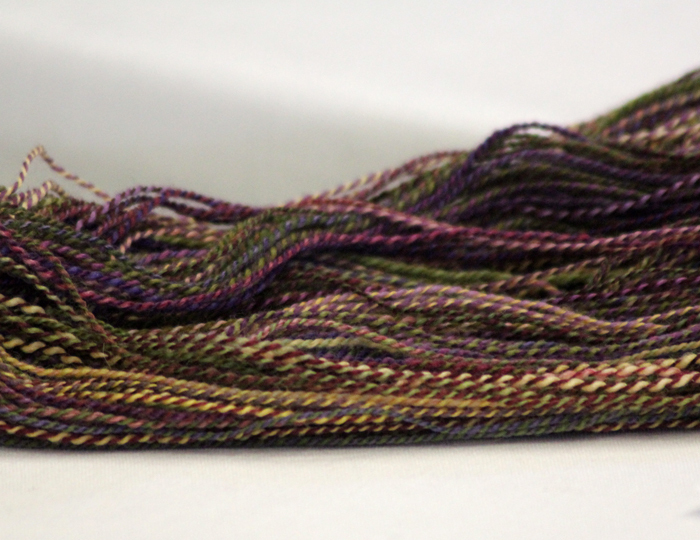 Love the colors and textures in this woven piece. These Pembrokes are so cute! 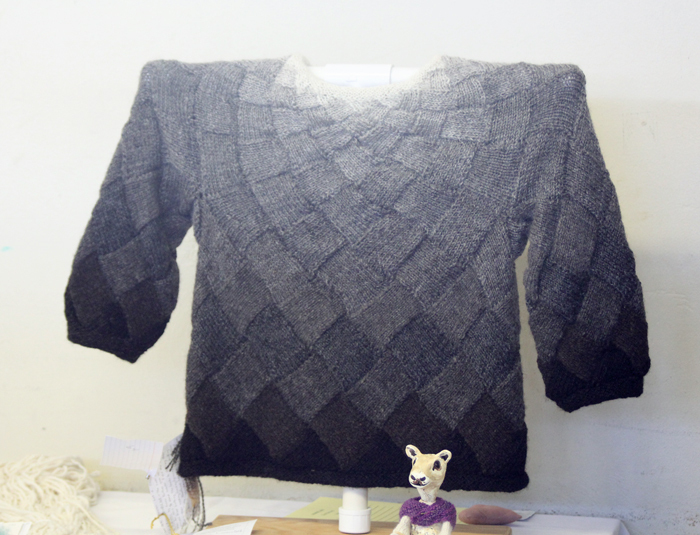 This sweater was made with Bluefaced Leicester yarn. 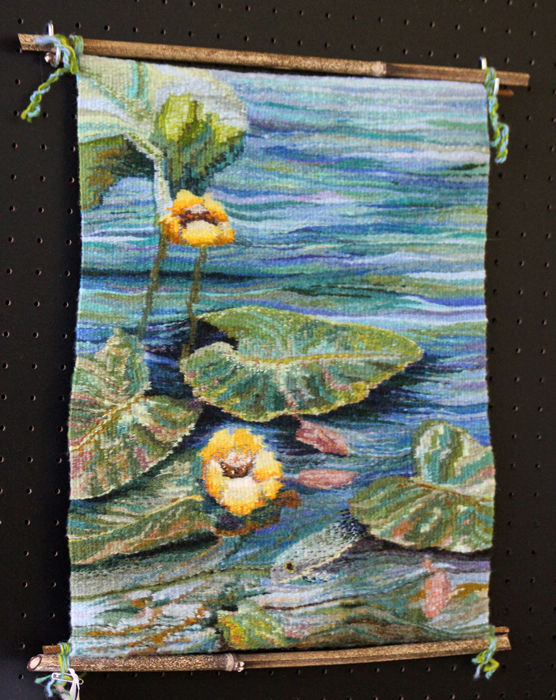 The colors and shading are beautifully done in this wall hanging. The consistency in this yarn is amazing! The size of this wall hanging and the details in the border were really something to see. 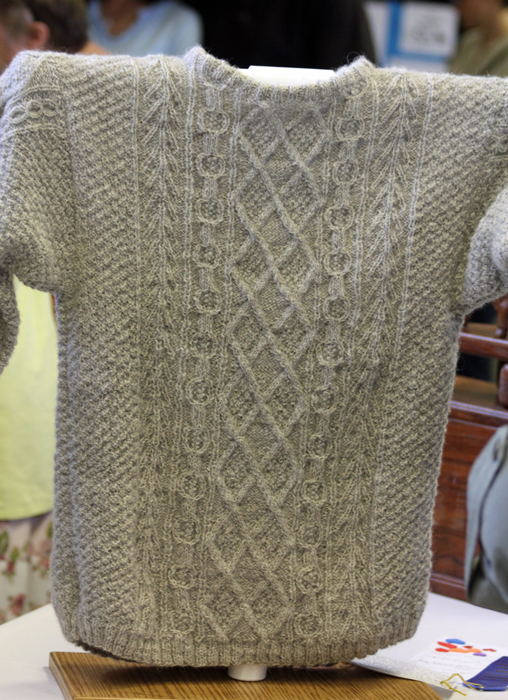 The pattern in this sweater is so intricate. 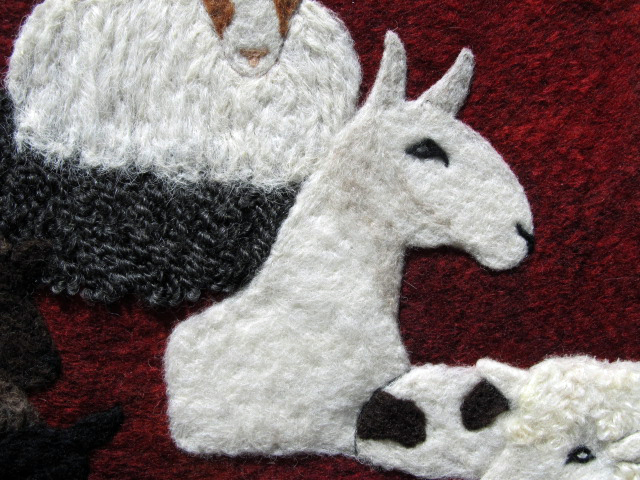 If I hadn’t seen this in person, I wouldn’t have believed it was needle felted and not drawn. I love the facial expressions – so sweet. This is my son’s favorite. He is so excited that it gets to live at our house for the next year. Never in my wildest dreams, did I think that one day my name would be added to the plaque! I am going to enjoy its presence every day it’s here. I find myself repeating those words over and over again in regards to the weekend we just had at Black Sheep Gathering. 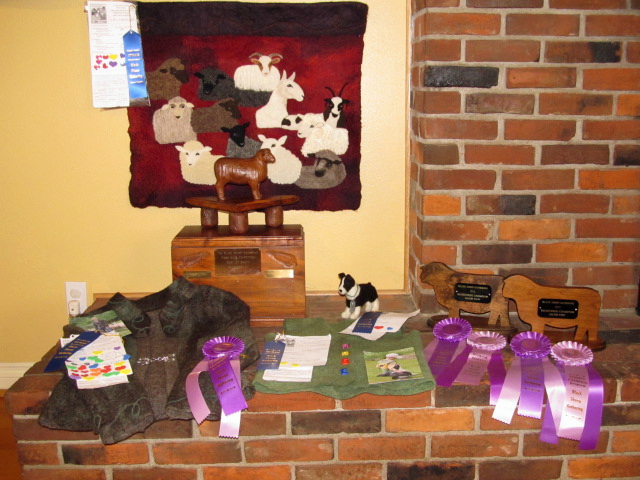 Blue ribbons for all of our Fiber Arts entries and the shocker of all was that my jacket won the Black Sheep Cup…the Best in Show of the Fiber Arts show! I still can’t believe it! 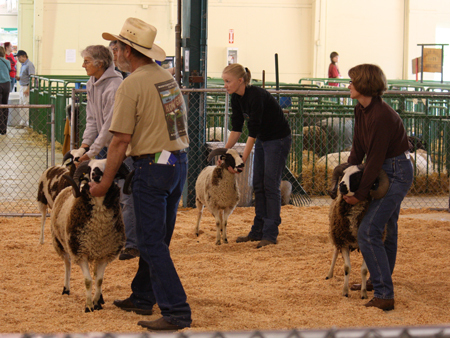 More about that later…this post is all about the sheep show. Thanks to Coleen and Toni for taking photos while we were in the ring! Coleen did double duty and helped us show as well. 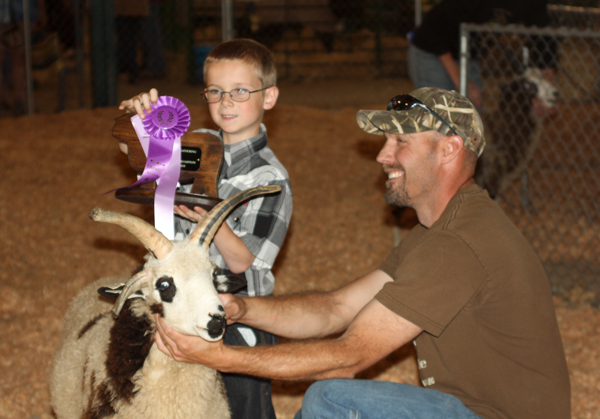 I love showing sheep as a family! 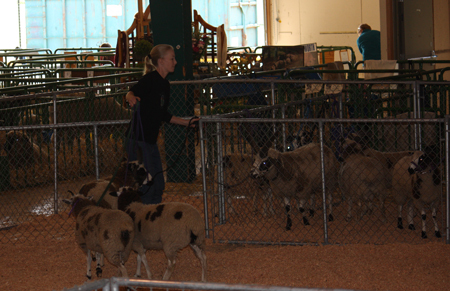 First in the ring were the rams. 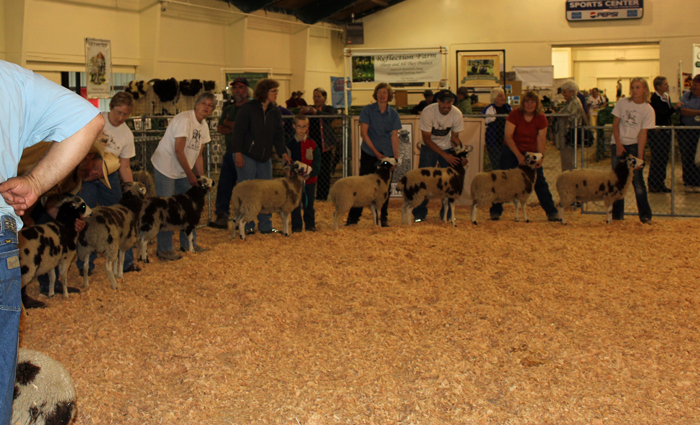 This picture is of the Champion class and includes the 1st and 2nd place Yearling rams and Ram lambs. 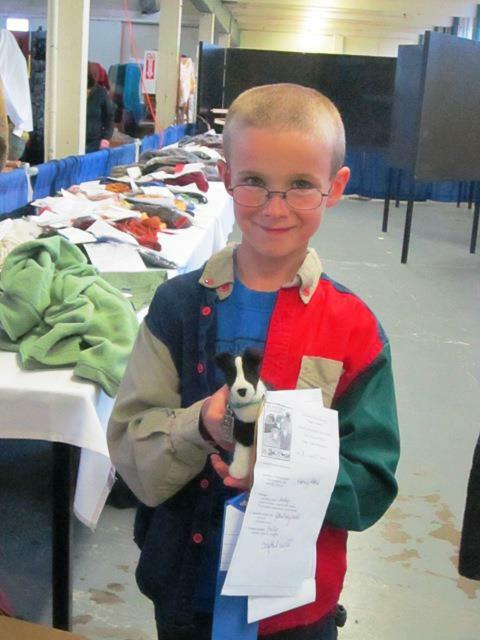 The Yearling ram results were…1st place – Kenleigh Acres with Byeburn Hector and 2nd place – bide a wee farm with bide a wee Dalton. 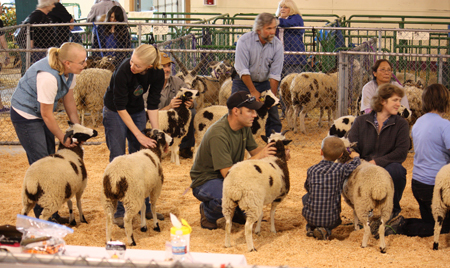 The Ram lamb class results were…1st place – Kenleigh Acres with Kenleigh’s Gusto, 2nd place – Windy Acres, 3rd place – Hunter’s Glen with Hunter’s Glen Rudolph, 4th place – Hunter’s Glen with Hunter’s Glen Roy Rogers, 5th place – Windy Acres, and 6th place – bide a wee farm. 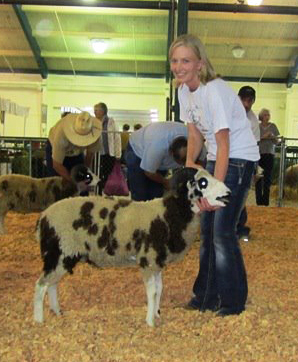 Reserve Champion Ram was Kenleigh’s Gusto. 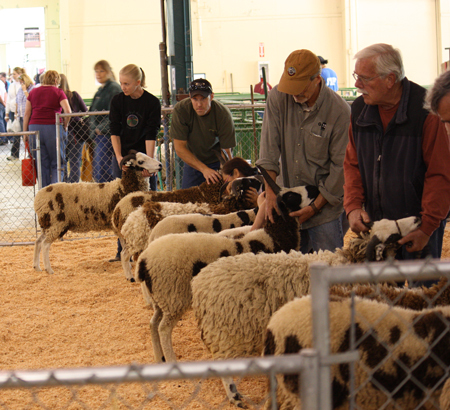 Here we are showing our Yearling ewe entries. 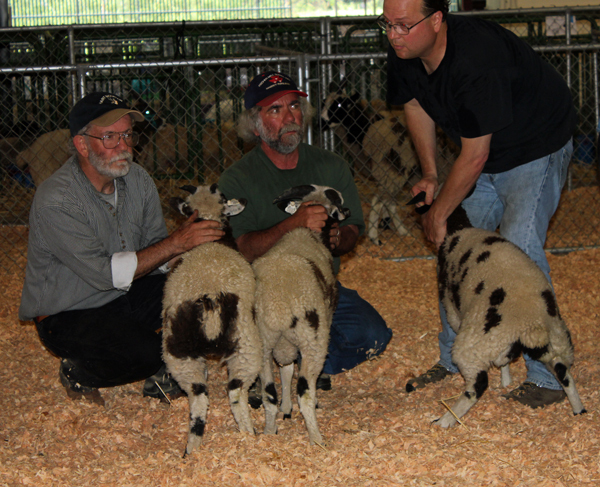 Yearling ewe entries from left to right – Windy Acres, 2 ewes from Drumcliffe Farm, and 2 ewes from bide a wee farm. 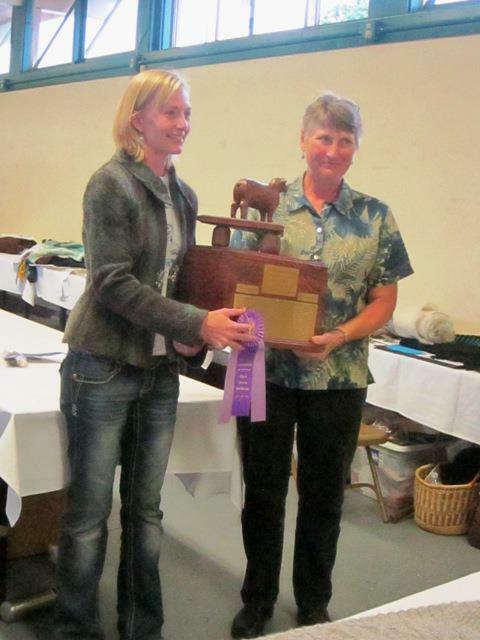 The Yearling ewe results were…1st place – Kenleigh Acres with bide a wee Shana, 2nd place – Kenleigh Acres with Kenleigh’s Emeline, 3rd place – Drumcliffe Farm, 4th place – bide a wee farm, 5th place – Windy Acres, and 6th place – bide a wee farm. 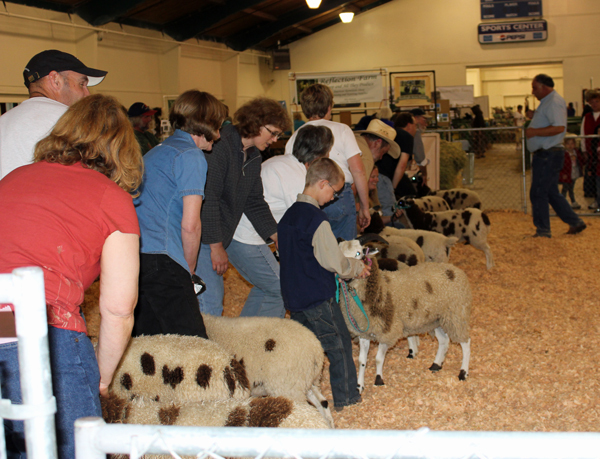 The large ewe lamb class. 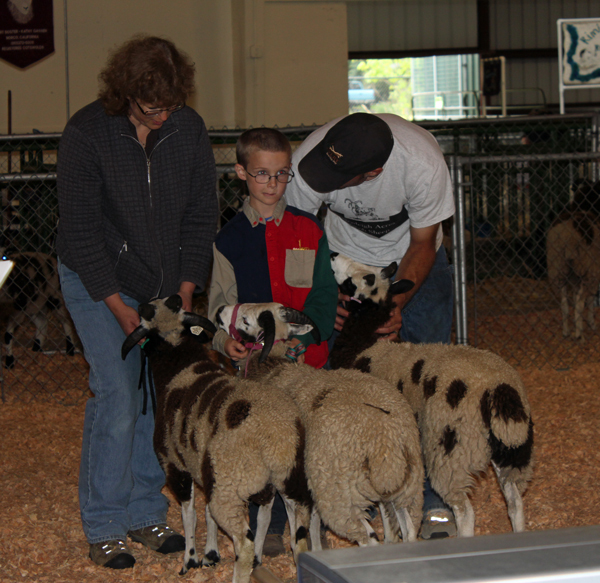 Another view of the ewe lamb class. 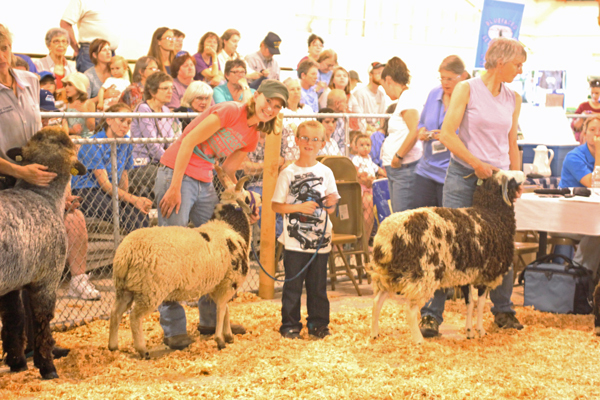 The Ewe lamb class results were…1st place – Kenleigh Acres with Kenleigh’s Elan, 2nd place – Hunter’s Glen with Hunter’s Glen Prancer, 3rd place – Windy Acres, 4th place – Kenleigh Acres with Kenleigh’s Folly, 5th place – Hunter’s Glen with Hunter’s Glen Cupid, 6th place – Mud Ranch with Mud Ranch’s Pansy. 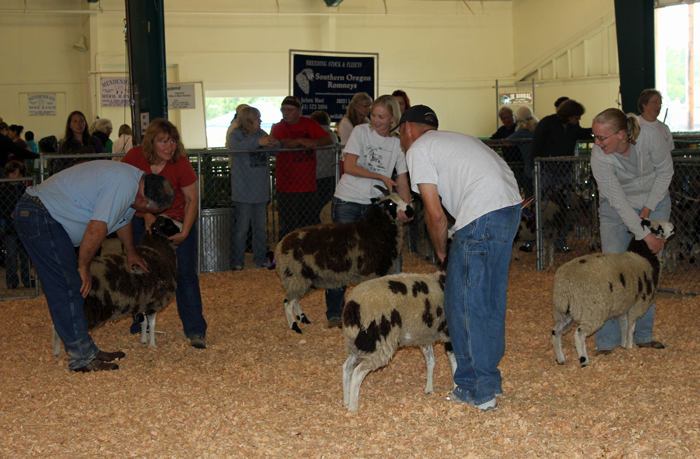 Here is the Champion ewe class. 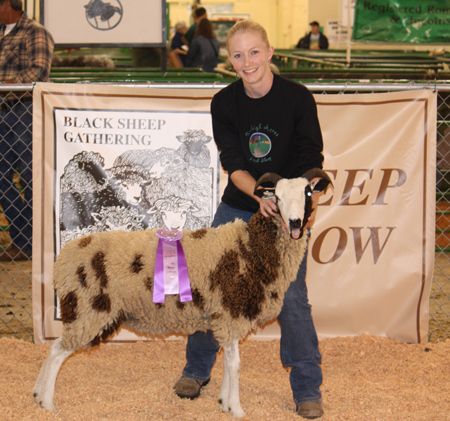 Champion ewe was bide a wee Shana and Reserve ewe was Kenleigh’s Emeline. 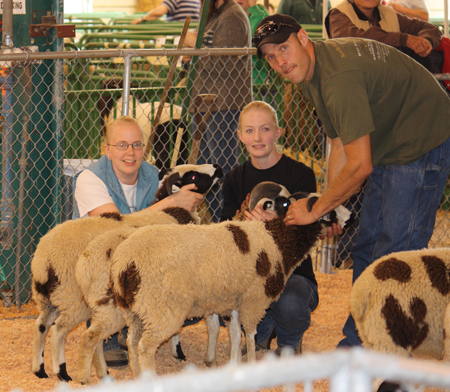 Next up were the Young Flocks from each farm. 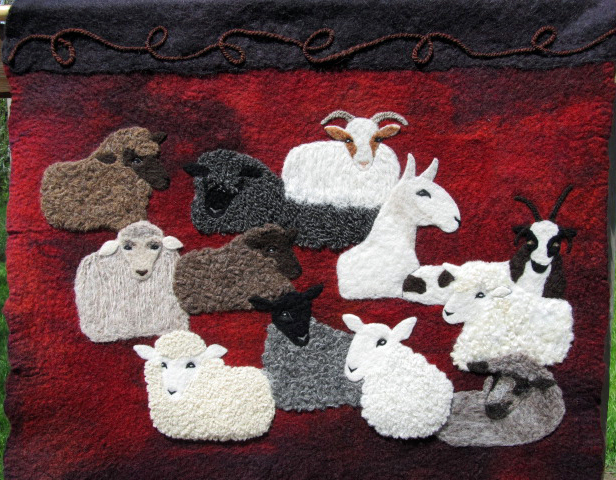 While I was taking my deep breath, I realized that I had not shared my Black Sheep Gathering Fiber Arts entry on my blog. 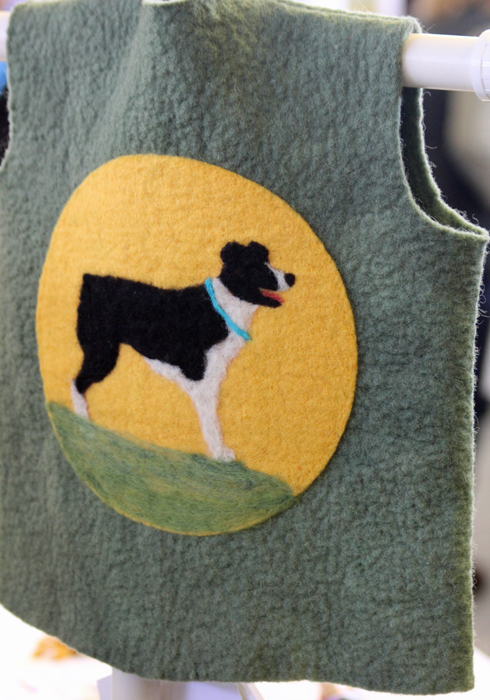 I used the BSG logo as my inspiration, but wanted to incorporate all of the wonderful breeds that can be seen at the show. 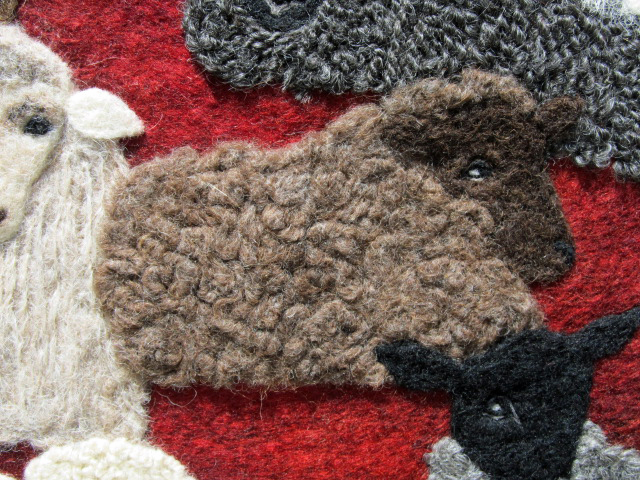 I used wool from each breed and most of it came from farms here in the NW. 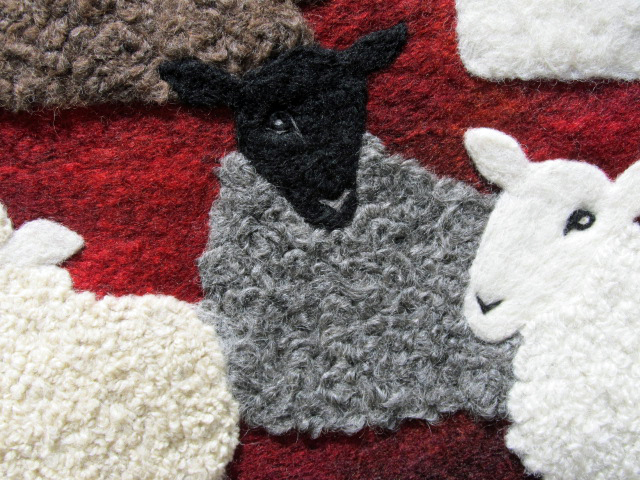 The only exception is the Wensleydale and that wool came from Jackie Post at Wooly Adventures. 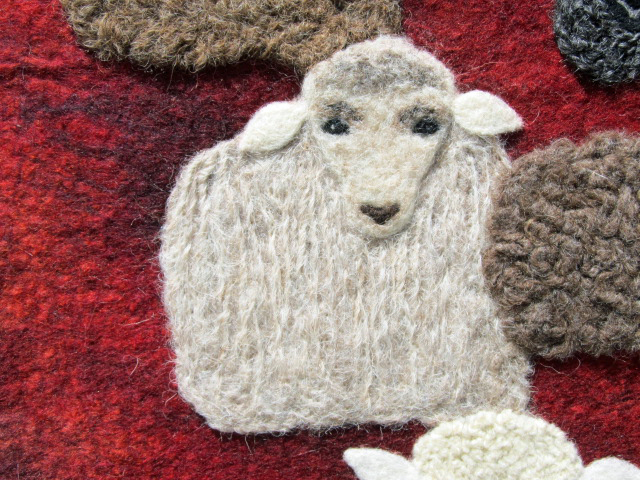 She lives in California and the wool came from Marley, a sheep with a LOT of character. 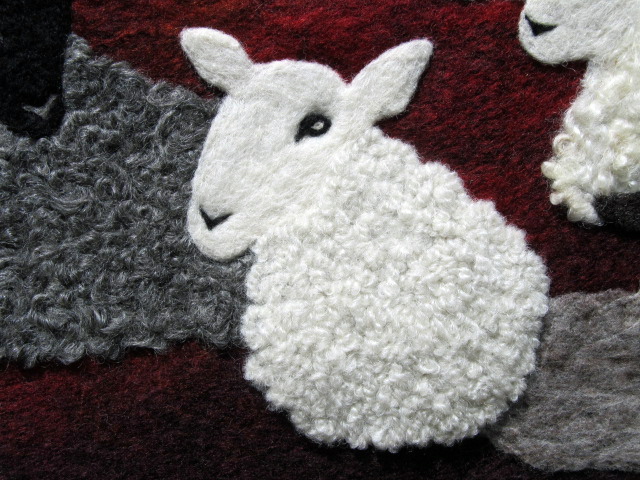 and the Border Leicester wool came from Coleen Smith at Blessed Creations. 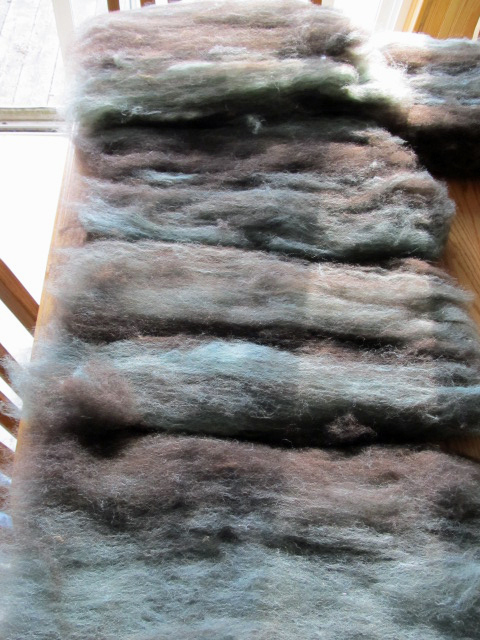 and the Gotland wool came from Wendy Hanson at Shaggy Bear Farms. 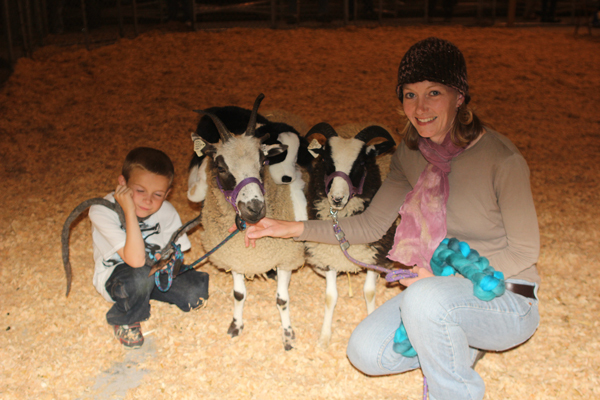 The Corriedale yarn came from Katie Orr at Critter Hollar Ranch. 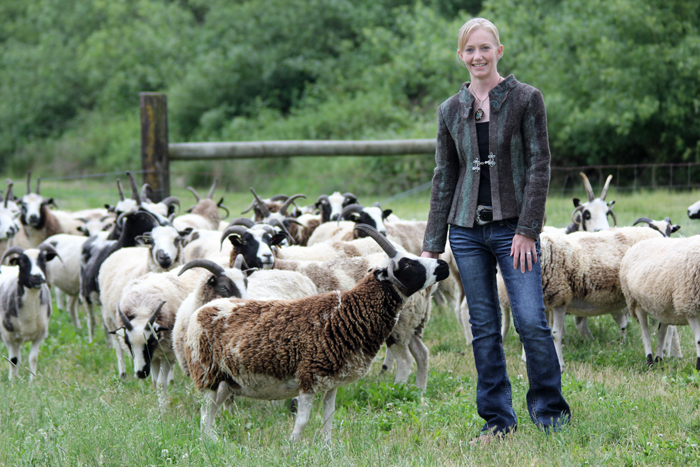 The Coopworth locks came from Lora Withnell at Rocking Dog Ranch. 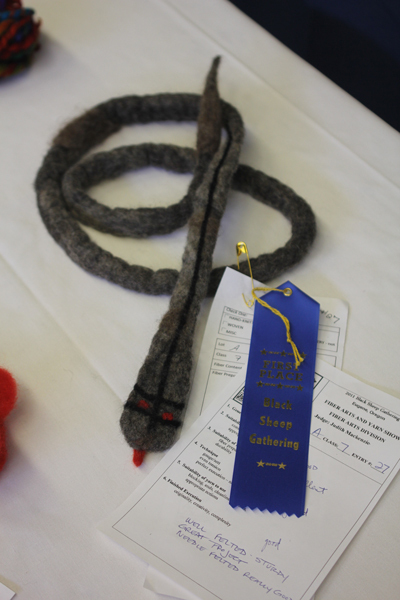 The Navajo-Churro wool and yarn came from Karen Lobb at bide a wee farm. 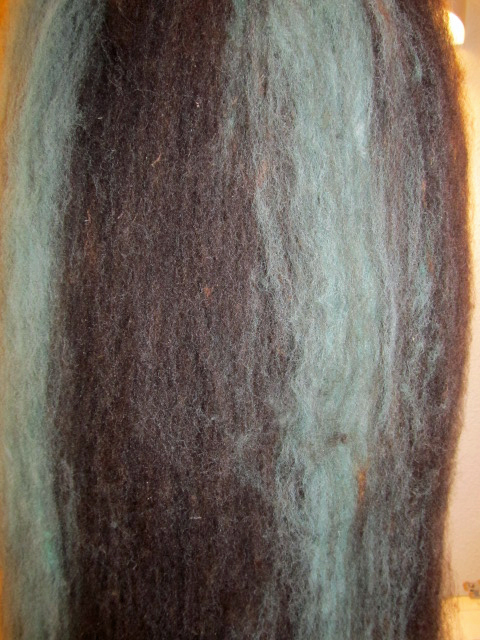 The Shetland wool came from my stash of roving from the Shetland sheep we had for a short period. 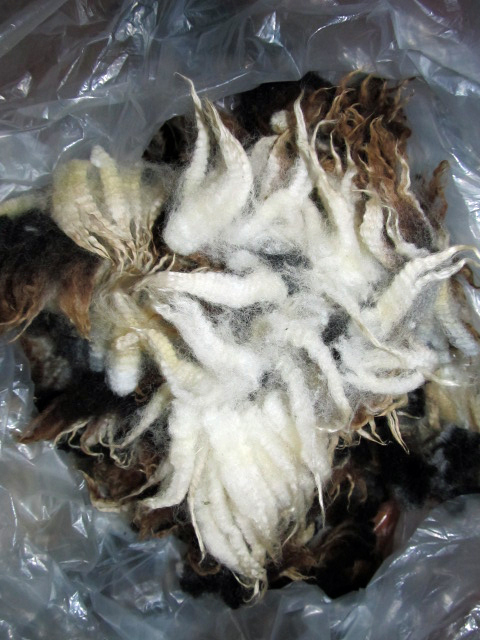 The CVM wool came from Correy McAtee at Custom Colored Critters. 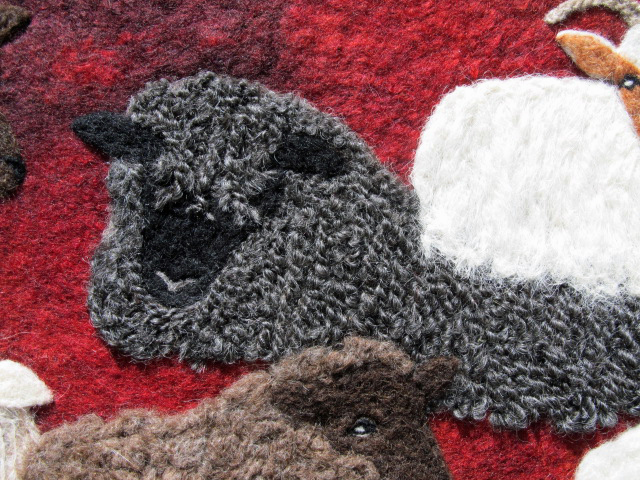 The Jacob wool of course came from our flock. 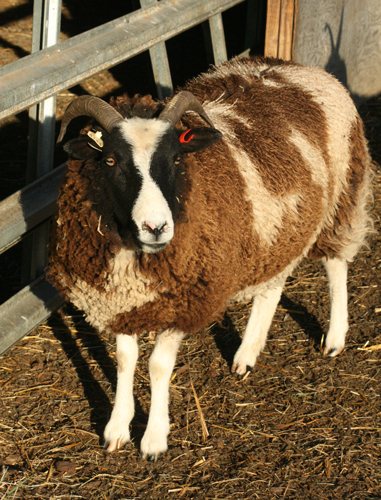 The Bluefaced wool came from Robina Koenig at Tumble Creek Farm. 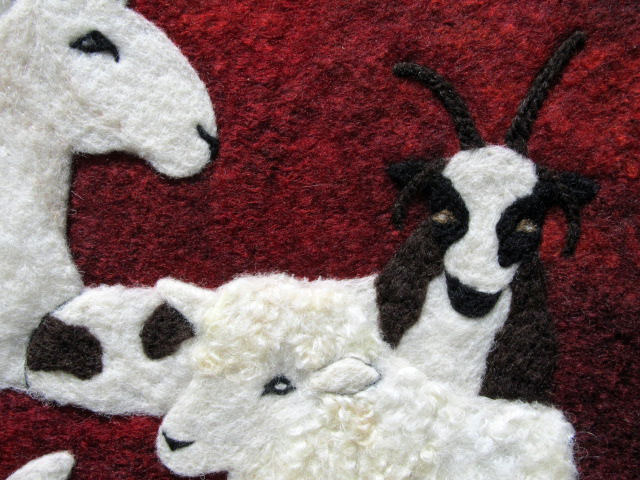 A lot of these farms are good friends and are going to be at Black Sheep Gathering – I can’t wait to see them! My son made his own felt Rose. 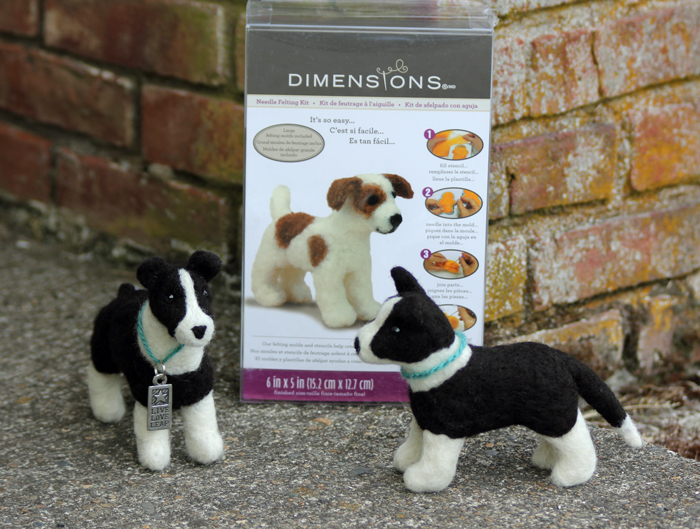 We used a new kit to make our own pups. The kit has molds and it was a safe way for a child to make a 3D felt object, less chance of poking fingers with the felting needle! Ok, break is over…back to work! 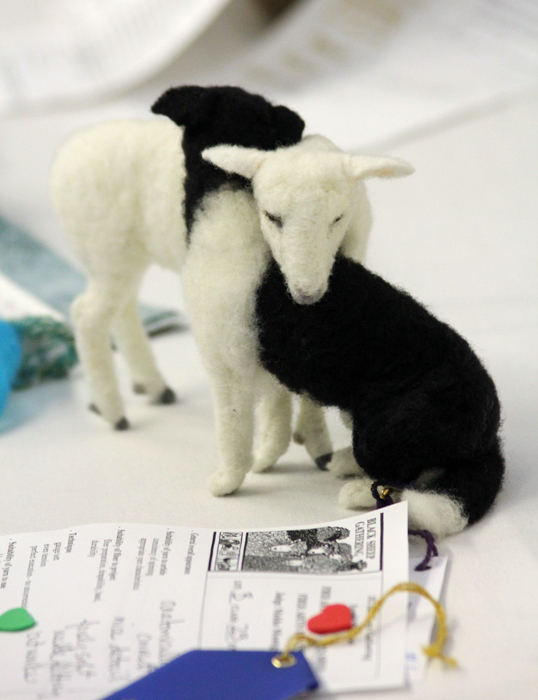 Make sure and say ‘Hi!’ if you are at the Black Sheep Gathering. 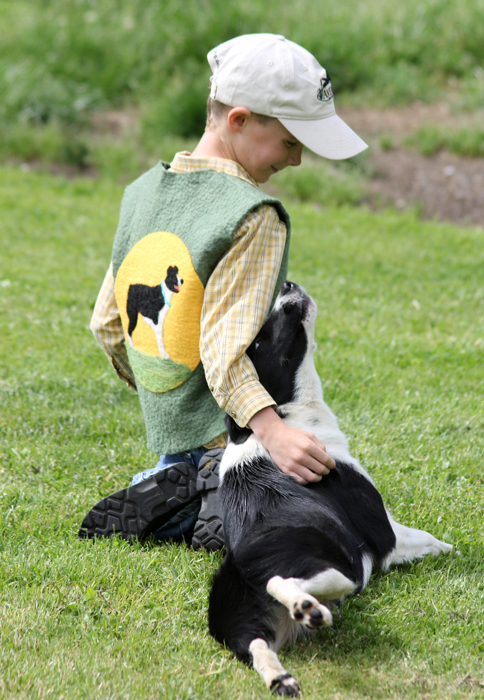 The last post was about my project for the Black Sheep Gathering’s Spinner’s Lead class, this one is all about my son’s project. 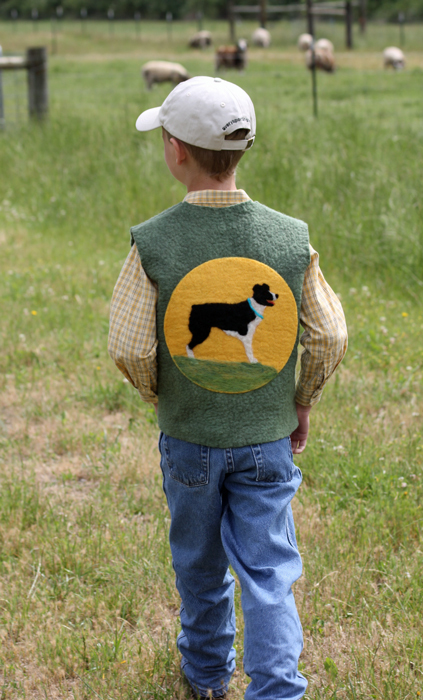 He had a clear idea of what he wanted – a vest with green and yellow and a picture of his dog, Rose, felted on it somewhere. 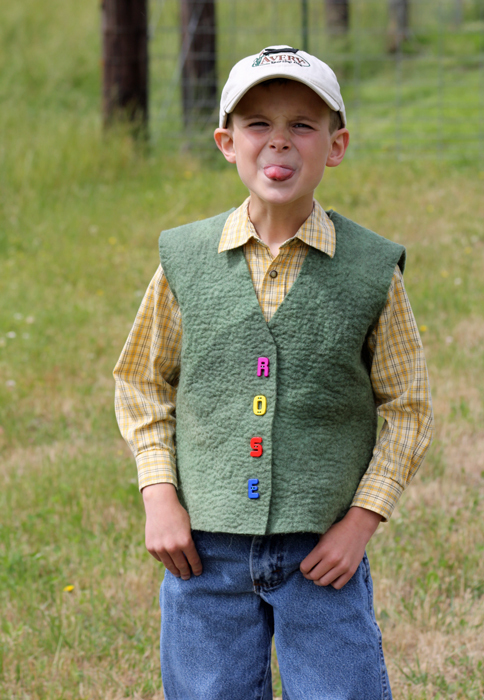 I had to brainstorm a little to figure out how he was going to needle felt Rose onto the vest. 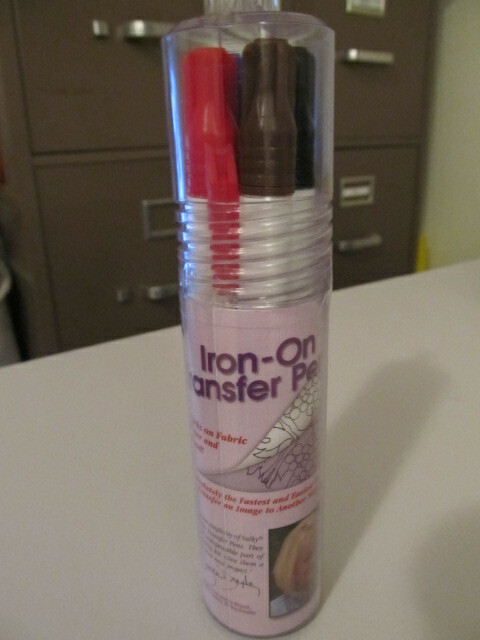 Thanks to a new product I am carrying in my shop, it was super easy! 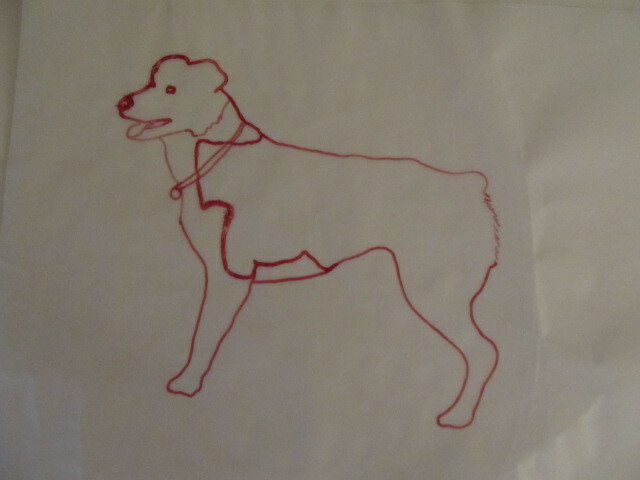 We then flipped it over and ironed it onto the felt. 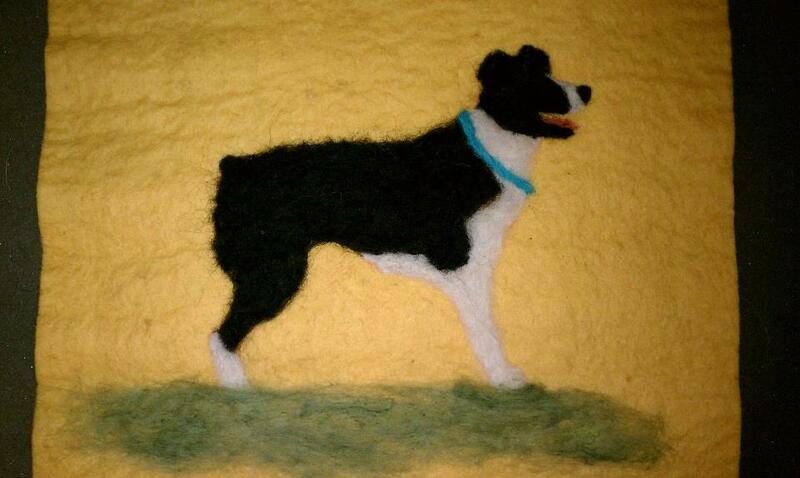 The pen marking transferred onto the felt and he was then able to fill it in with color and needle felt it. Didn’t he do a good job!!! 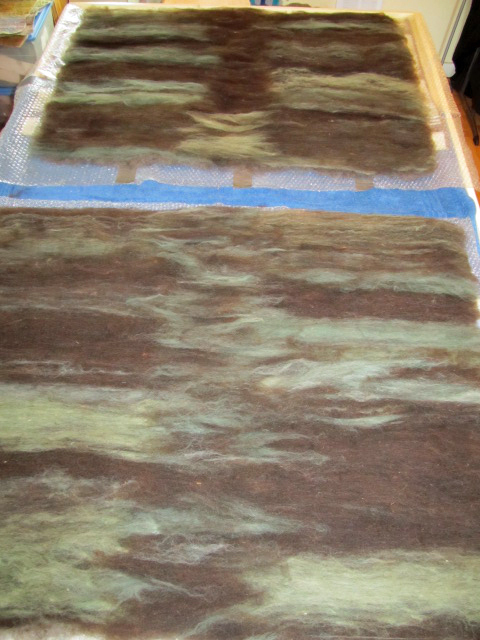 After the vest was cut out, we dyed it – he wanted a muted kelly green. 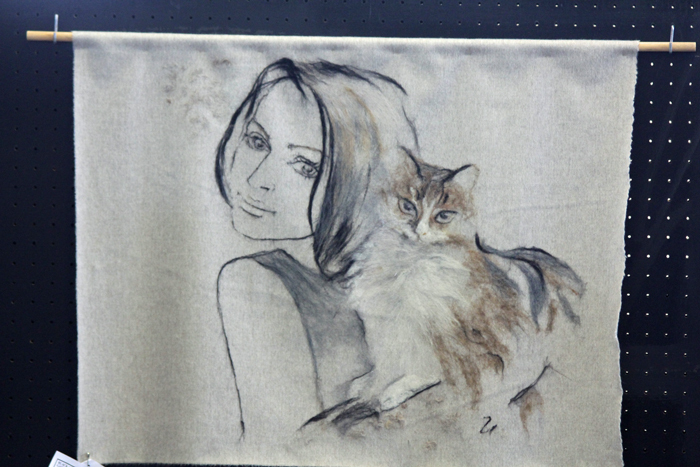 Once the vest was dry, he needle felted the picture of Rose onto the back. The last thing that needed to be done was buttons. We bought some fun, different colored, letter buttons. He had a hard time deciding what to spell out, but finally decided on ‘Rose’. Headed out for his ‘photo shoot’. 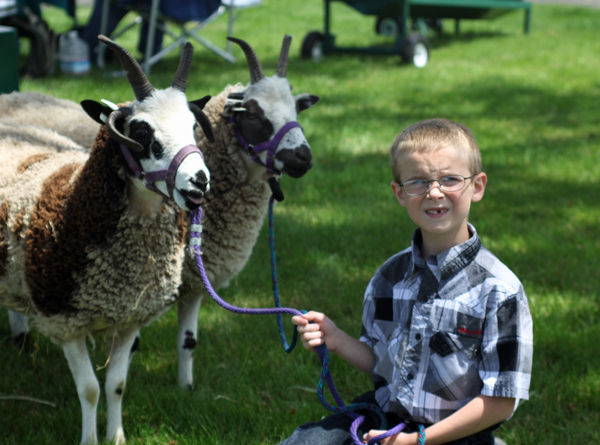 Here he is with 3 of his lambs – Roy Rogers, Prancer, and Cupid…they were so nice to cooperate! 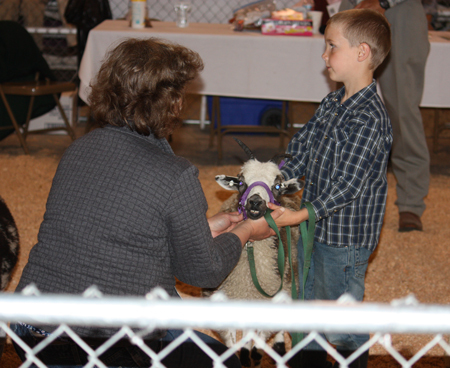 Roy Rogers is the lamb he is going to walk in the Spinner’s Lead and he is Precious’ first lamb. We couldn’t take pictures without taking pictures with Rose. He really did a good job capturing her essence. 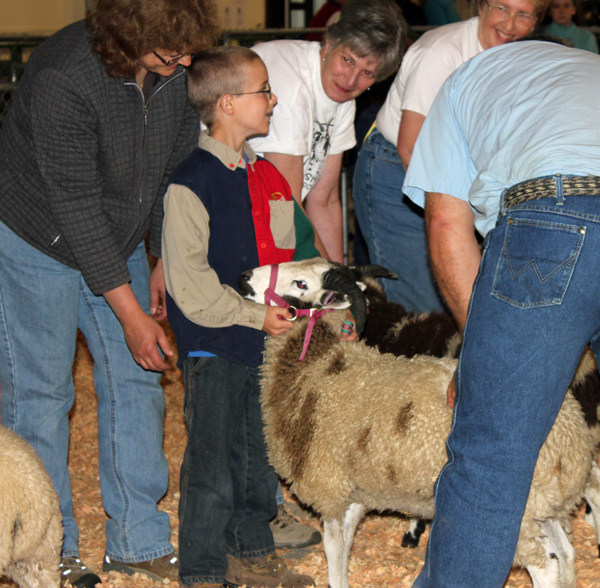 Black Sheep Gathering is just around the corner…just 8 days away to be exact. Each year, for the last 5 years, I have done a project for the Spinner’s Lead event. I strive to come up with inspiration for the next year’s project fairly early on and let it mull around in my mind and then cram it into the couple of weeks before the event. I really wanted to get away from the stress this creates, not to mention the fact that last year I ran out of time because my original plan didn’t work. 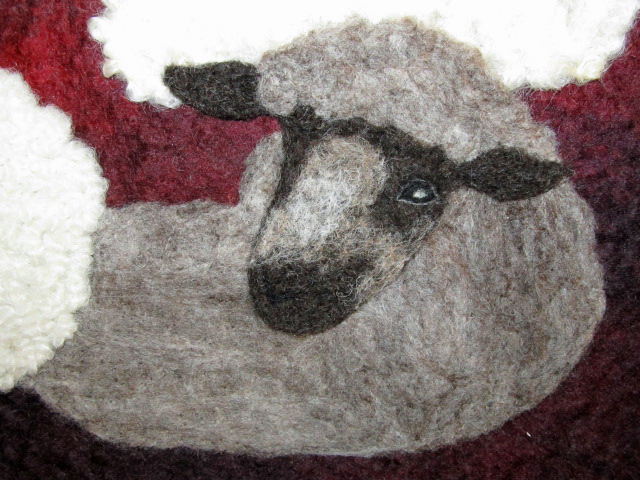 I started this year’s project a couple of months ago and the first step I had to take was deciding on who’s fleece I was going to use. Infiniti is one of my favorite girls and she has a lovely fleece. 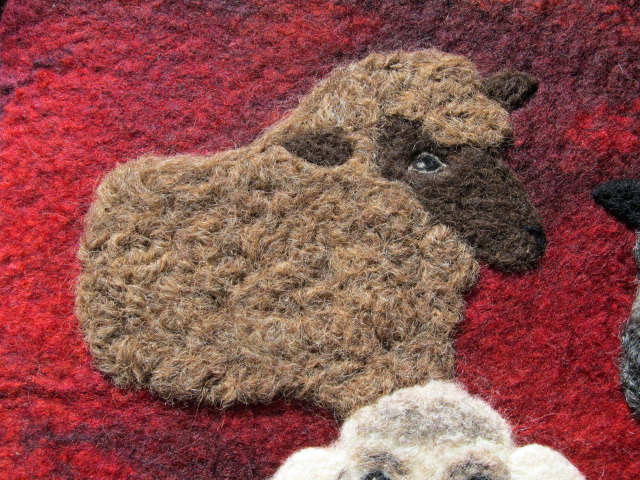 I also used Hector’s fleece. 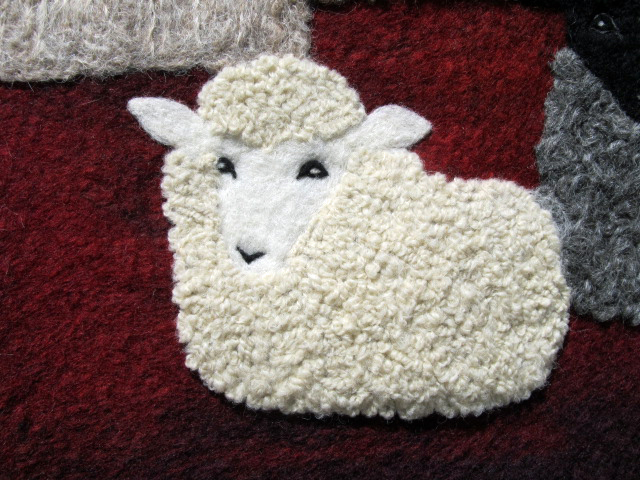 His lamb fleece was so soft! 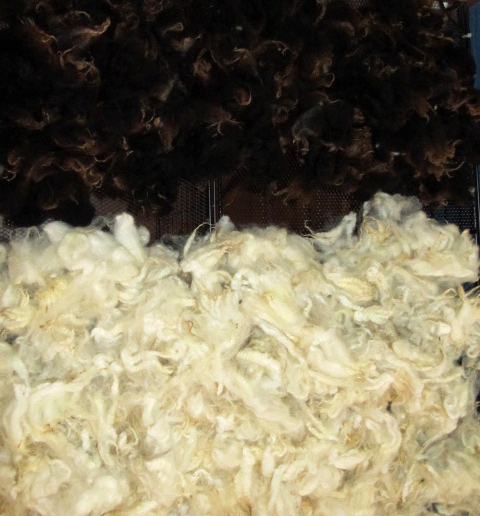 After deciding on what fleeces I wanted to use, I had to wash them. 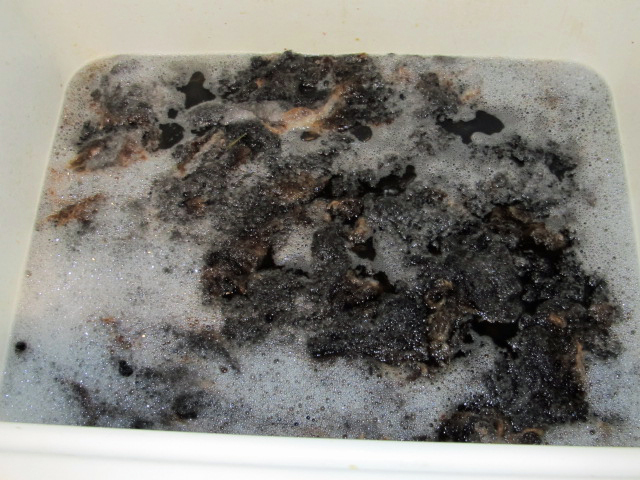 I separated the black from the white before washing the fleeces. At this point I still didn’t have a clear idea of what I wanted to do, but I knew it was going to be some kind of jacket. 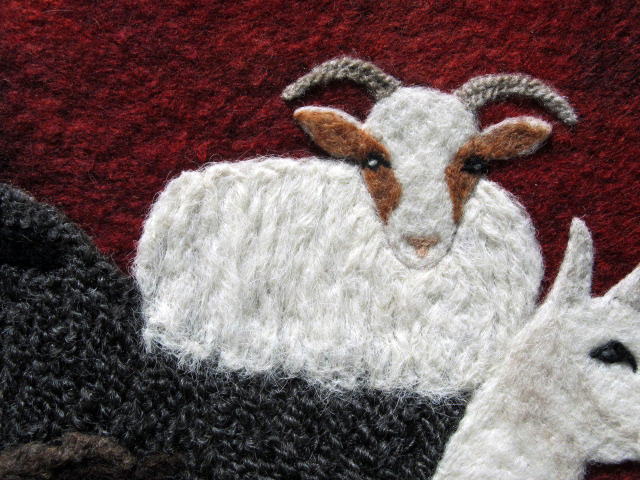 I started carding the white wool and decided that I wanted to add some color. 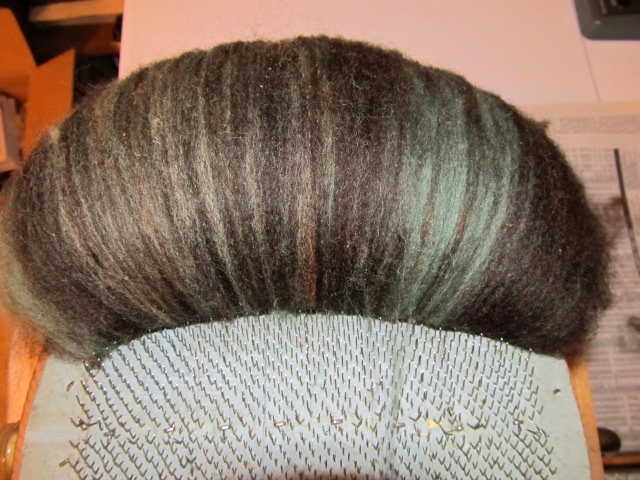 After carding the white, I dyed it various shades of green. From there I carded the green with the dark charcoal. I had input at this stage because I was really struggling with how to blend it, do I do stripes, half green/half charcoal, fully blended??? The final result was kind of a combination of all the possibilities. 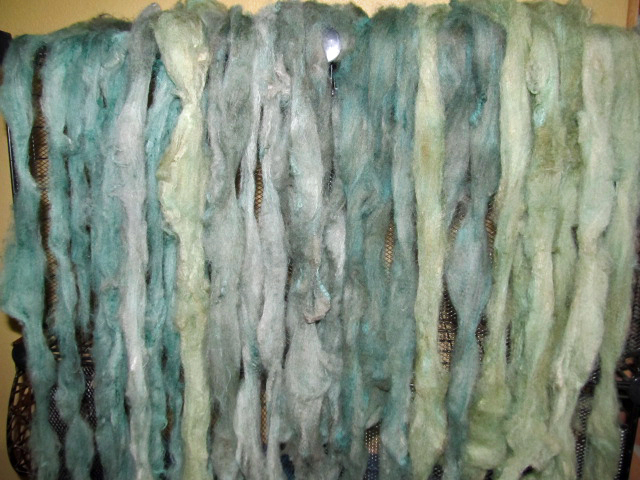 After carding and carding and carding some more, I had 15 batts to work with. 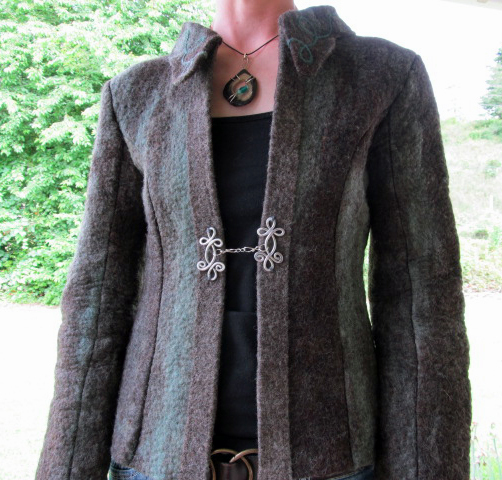 At this point, I had a pattern picked out and had a rough idea of how much felt I would need to make for the jacket. 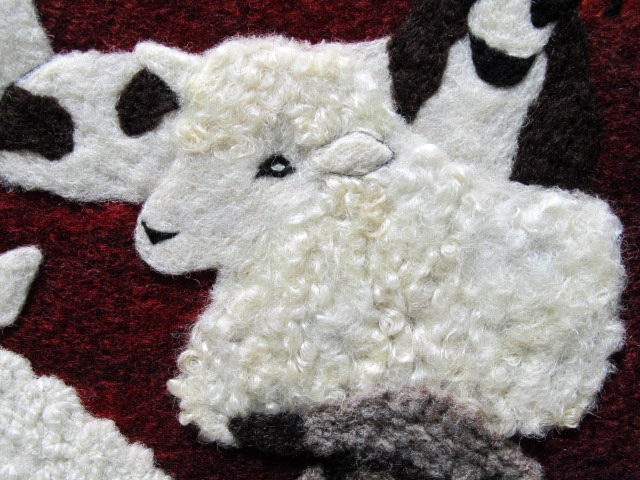 I laid the fiber out and created 4 pieces of felt that were approximately 30″ x 36″. 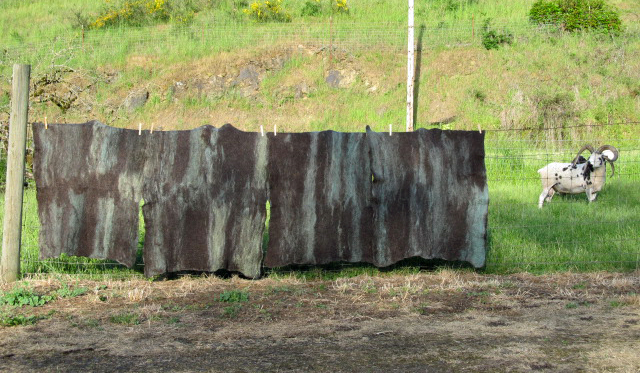 I wet felted it and did a lot of soapy, sudsy rolling. 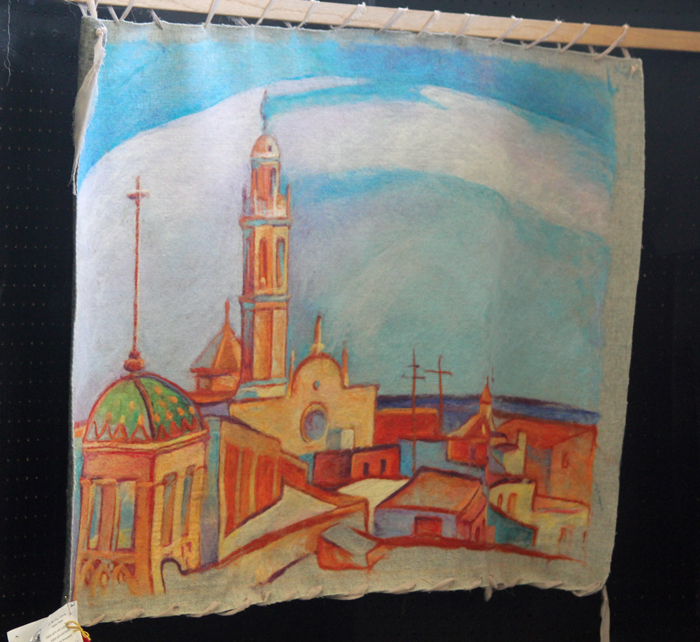 I lucked out in the weather department and had a sunny afternoon to dry the felt sheets. Next, it was up to my mom’s to make sure I was measuring and cutting and sewing it the right way. 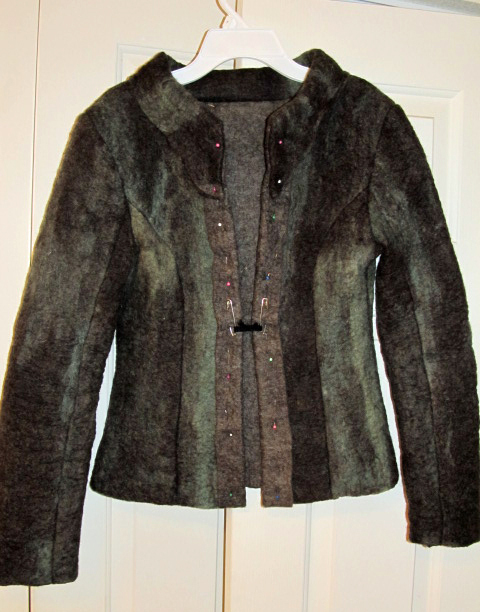 I would have really been in trouble if I didn’t go up there because the jacket pattern I was using was one I had used previously several years ago and I left one of the pattern pieces up there. By some miracle, she still had it and we are now calling her closet the ‘magic closet’ because we opened it and there was the pattern piece! The jacket fit, but it didn’t really ‘fit’ the way I wanted it to. It needed to shrink a little…why not felt it some more! I wetted it back down and rolled it some more and it did exactly what I wanted it to. 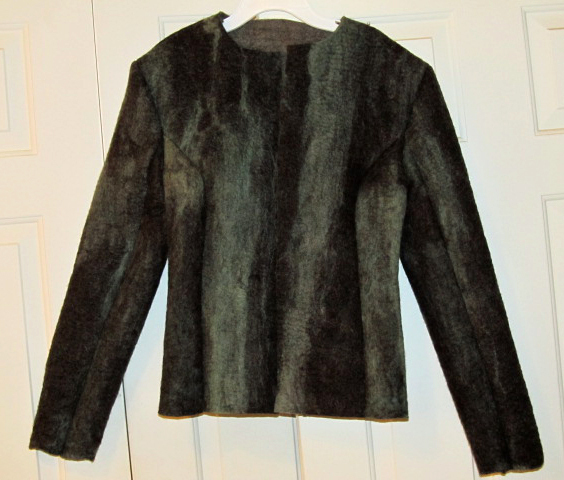 Unfortunately, the collar area shrunk a little too much – oh no…what to do??? 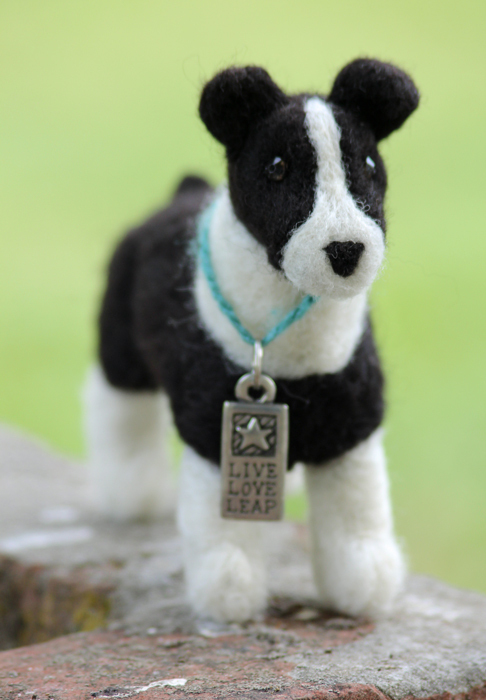 I had extra felt and thought…how hard can it be to add a collar? Felt is so forgiving, so adding a collar wasn’t very difficult and I am much happier with the result. The celtic knot closures came from a local company that I have ordered from before. Nicholas and Felice have beautiful jewelry pieces. These were originally earrings, but I could see the potential of using them as a closure. I can’t put into words, how happy I am that this is done well before it needed to be. Now to finish everything else that needs to be done before the big event! 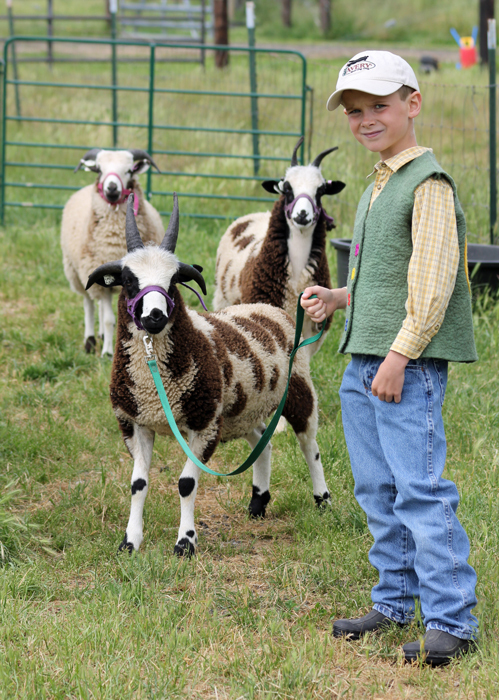 Every year our son participates a little bit more during the Black Sheep Gathering weekend. This year he told me he didn’t want to miss ANY of it! I had previously scheduled for him to spend Thursday night with his grandma and grandpa, but he wanted to stay and help. He was up early and to bed late for 3 days in a row and continued to be a big help! I am very proud of how he is growing up. Giving his girls a little bit of fresh air before show time – Echo and Precious. 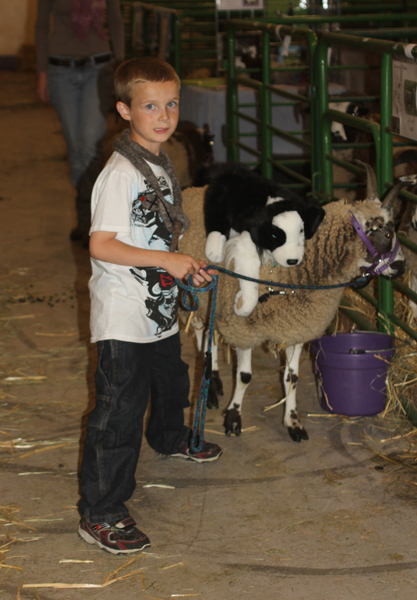 He did a great job showing his sheep by himself and had great help for his sheep that were in the same class. 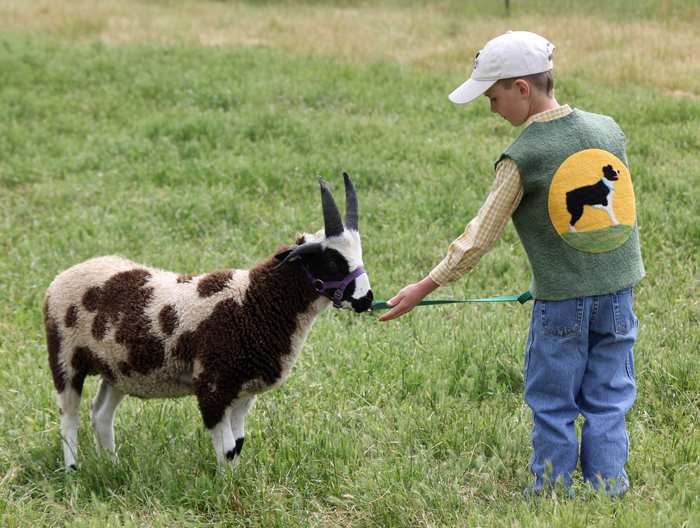 Even when they are halter broke, jacob sheep can be a little squirrely and he stayed composed and handled it well. 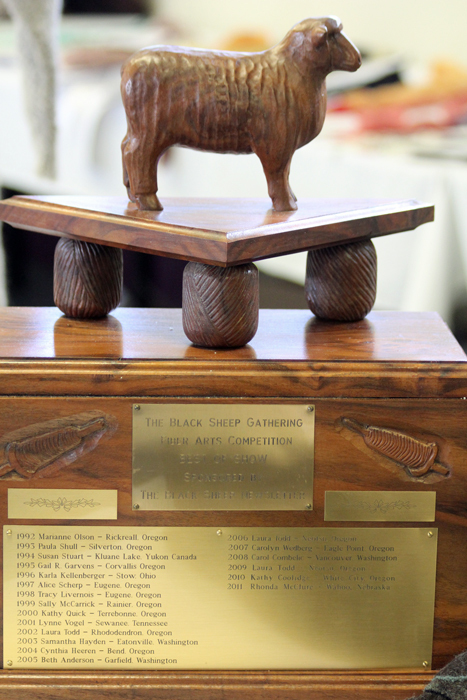 We were all surprised when he won Champion Ram with his lamb that has now been named ‘Moose’ because he hasn’t missed many meals! The judge, fellow jacob breeders, and show staff were very nice when they paused the show so he could be videoed by the tv crew that was there. He was thrilled to see himself on the news later that night. It has become a tradition for him to make something and participate in the Spinner’s Lead. He looks forward to it and this year was no different. When I asked him what he wanted to make, he told me ‘a BIG snake’. 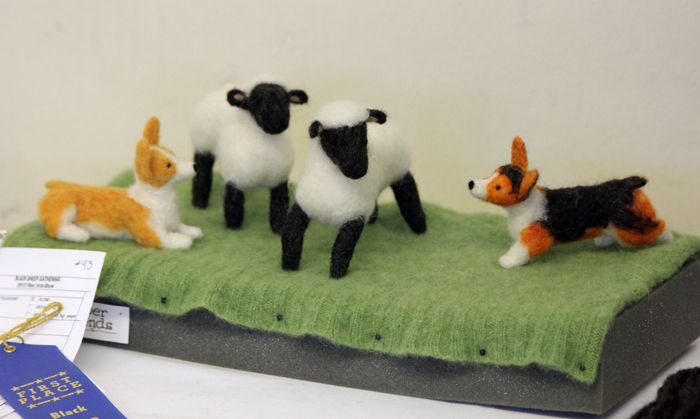 He started by wet felting the body and then he got creative with the needle felted add-ons. 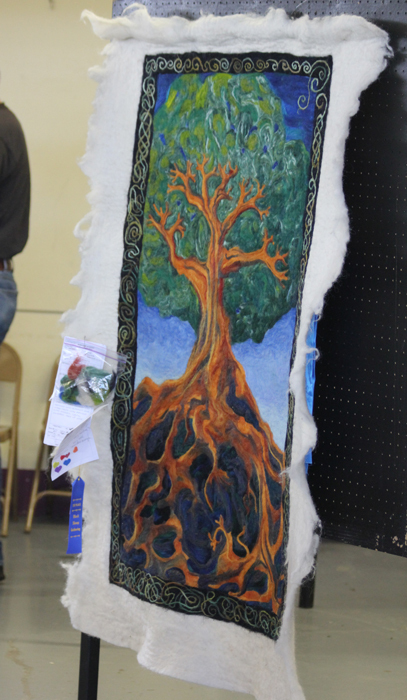 At the last-minute I remembered the Fiber Arts division and he entered it in the Youth Felted division. 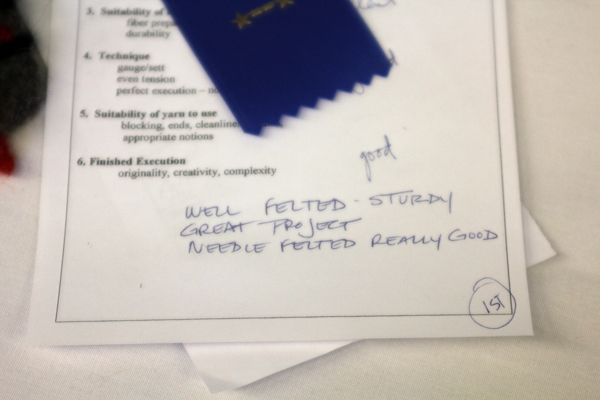 He got 1st place plus some very nice comments from the judge, Judith MacKenzie! 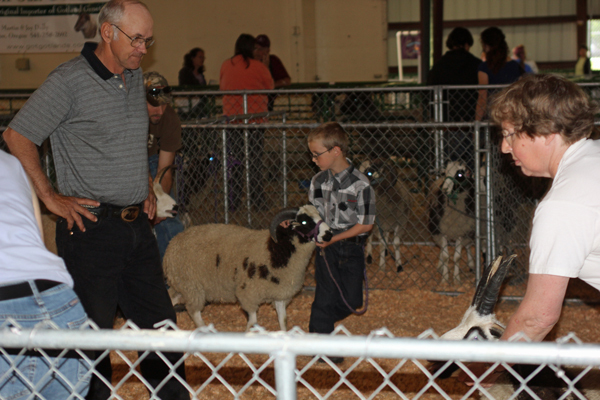 Saturday afternoon saw us back in the show ring with his Champion Ram for the overall Champion. 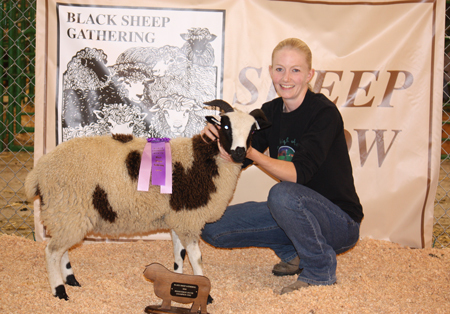 Robin from Meridian Jacobs is in front of us with her Champion Ewe, Hot Lips. While we were in the ring we had a very good discussion on what the judge was looking for and that it was an honor for us to be there. 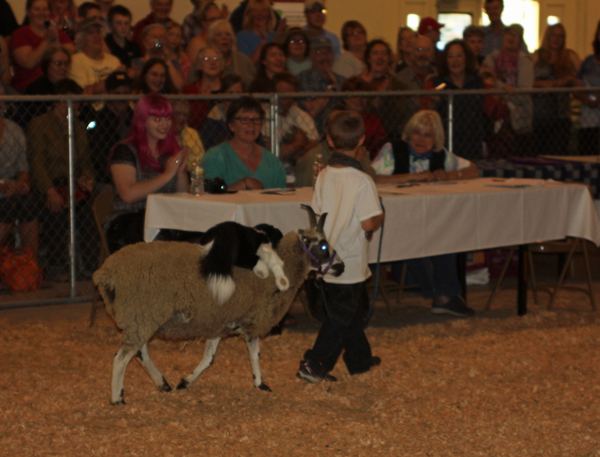 My son picked a very nice White Romney as the winner and the judge did pull him out, but it was the Mendenhall’s Merino that ended up winning it all. The Spinner’s Lead is held after dinner on Saturday night and I believe it started at 8:00, a late night for all of us! He has built quite the fan club and Trish the announcer just adores him. Thanks to Coleen, Kelly, and group for coming back just to cheer him on! I can’t wait to see what he decides to make for next year. He held it together really well, but was pretty tired by the end of the weekend. 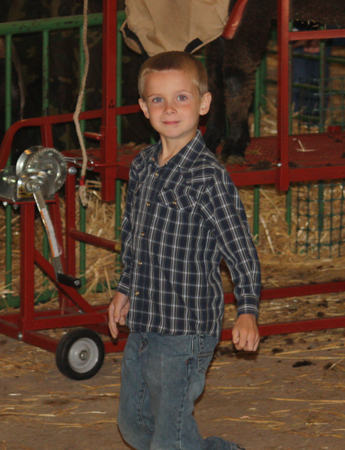 I love that he enjoys the sheep stuff just as much as I do! The Jacobs show on Friday of BSG, it is nice to get it out of the way early. I enjoy showing, but my back doesn’t! 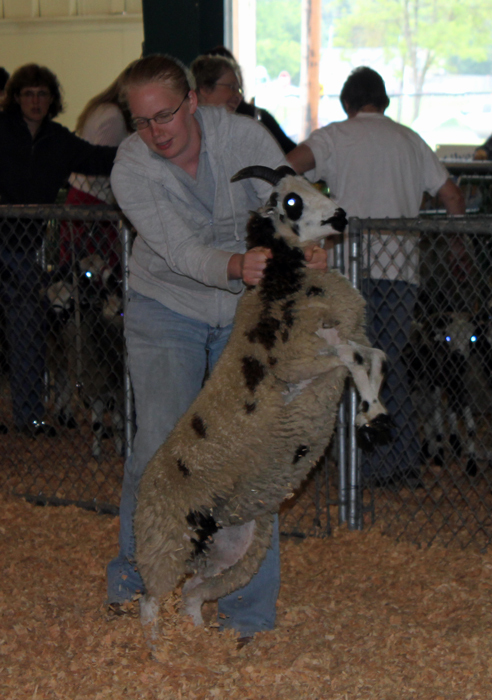 The sheep were easy to handle, which made the job a little easier. I love having halter broke sheep!!! It is so nice walking 3-4 sheep at a time, instead of dragging them one at a time like we used to. 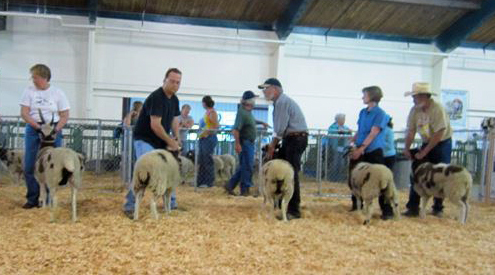 Left to right, 1st to 5th place – bideawee Glyn, Kenleigh’s Imagine (owned by bide a wee), Patchwork Abraham (owned by us), a Drumcliffe ram, and not pictured – a Swallow Lane ram. 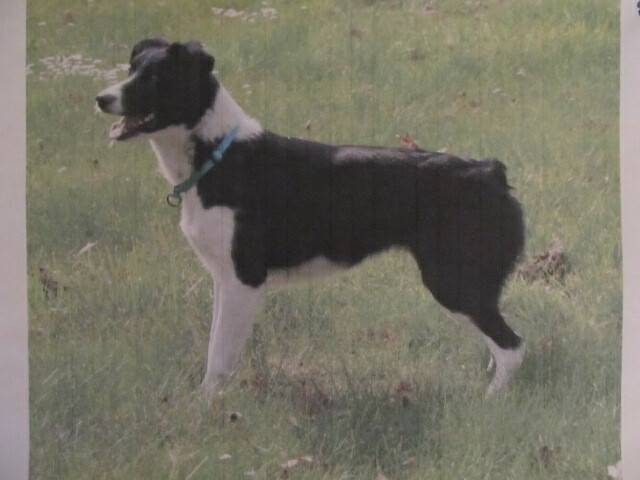 All were beautiful representatives of the breed! It was a big class with 14 being shown. 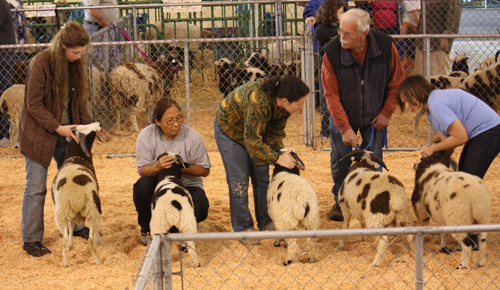 Left to right – bideawee, Kenleigh’s Silverton, Kenleigh’s Buchanan, and Meridian. Left to right – Meridian, Black Oak Ranch, Black Oak Ranch, Mud Ranch, and Swallow Lane. Left to right – Swallow Lane, Mud Ranch, Drumcliffe, Drumcliffe, and bide a wee. The placements were: 1st – Meridian, 2nd – Kenleigh’s Buchanan, 3rd – bide a wee, 4th – Swallow Lane, 5th – Kenleigh’s Silverton, and 6th – bide a wee. 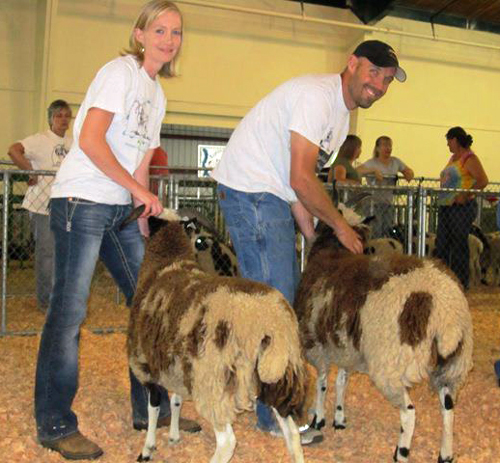 Pair of ram lamb placements – 1st – Kenleigh, 2nd – Meridian, 3rd – bide a wee, 4th – Swallow Lane, 5th – Mud Ranch, and 6th – Black Oak Ranch. 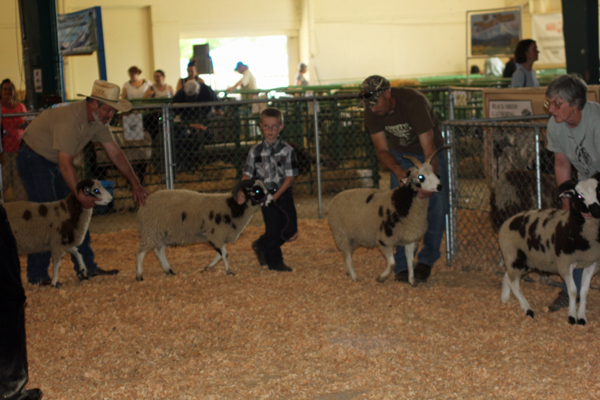 Champion ram was bideawee Glyn – front left and Reserve Champion was the Meridian ram lamb behind him. 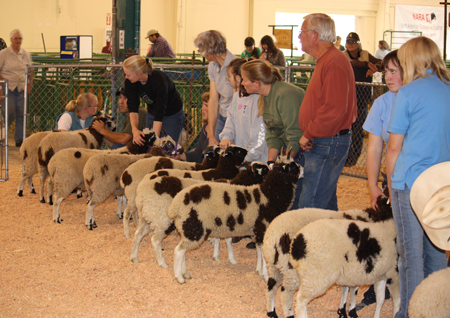 Yearling ewes, left to right – Kenleigh’s Flirt, Windy Acres Delight (owned by us), Black Oak Ranch, Swallow Lane, Swallow Lane, Drumcliffe, Mud Ranch, Mud Ranch, and Drumcliffe. 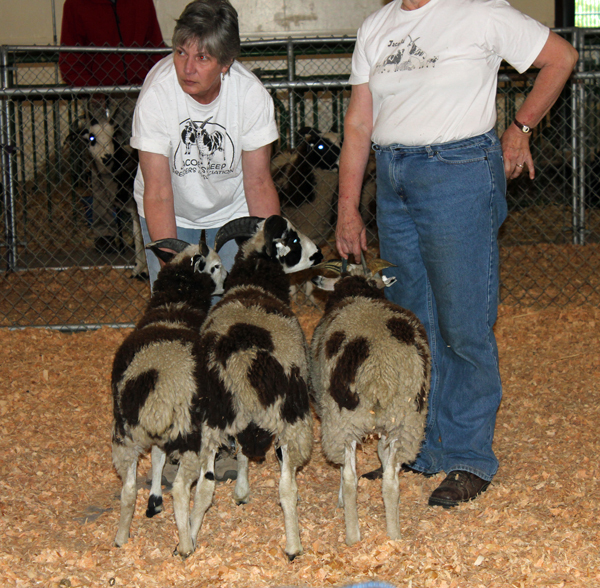 There were two bideawee yearling ewes as well, but they aren’t pictured. Placements: 1st – Kenleigh’s Flirt, 2nd – Drumcliffe, 3rd – bide a wee, 4th – Windy Acres Delight, 5th – Drumcliffe, and 6th – bide a wee. 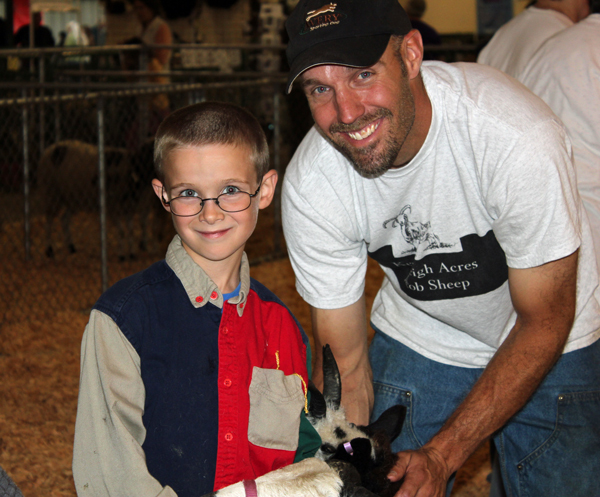 The ewe lamb class had 16 sheep in it, including my son’s first lambs. He showed Precious with help from a friend. 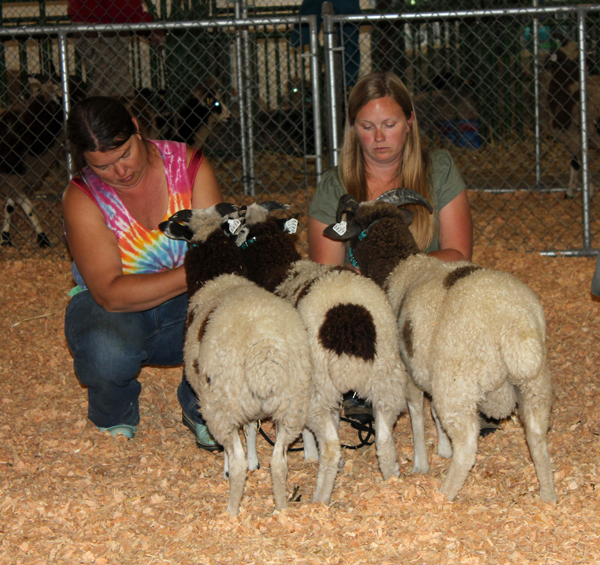 Here is a picture of our 4 ewe lambs in the top four spots! Kenleigh’s Mollala, Kenleigh’s Sublimity, Hunter’s Glen Echo, and Hunter’s Glen Florence (Precious). 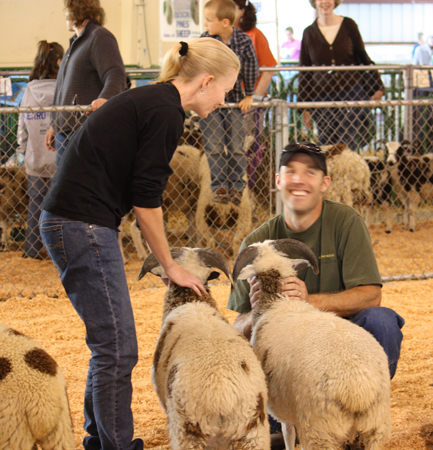 Here is a picture of the Pair of Ewe lambs class. 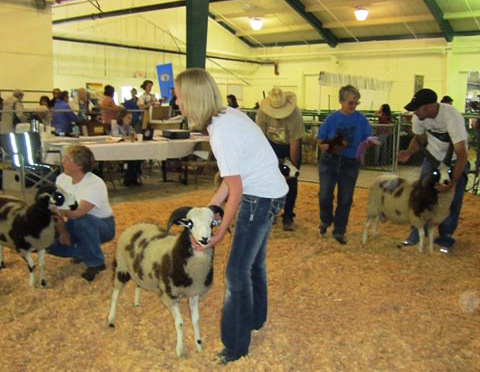 Placements: 1st – Kenleigh, 2nd – Hunter’s Glen, 3rd – Meridian, 4th – Mud Ranch, 5th – Swallow Lane, and 6th – bide a wee. 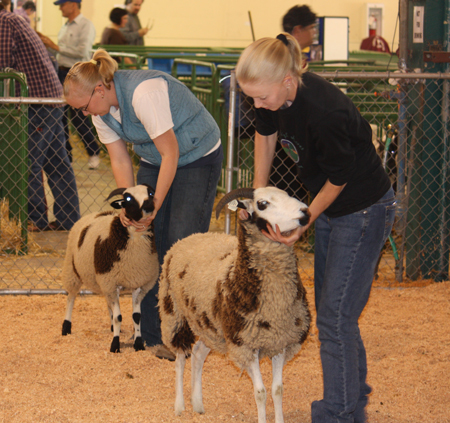 My sister is showing Mollala and I am showing Flirt – they were awarded Champion and Reserve Champion ewe. I love having my sister’s help! I also love having my husband’s help! I don’t know what he is laughing about here, but these are the moments I really enjoy about showing. These moments are pretty fun too! Mollala is the result of a love affair that I couldn’t say ‘no’ to. Her mom, Holly, wasn’t going to be bred – but her and Julian had different ideas 🙂 I finally gave into their longing glances through the fence and am so happy that I opened the gate. She is a very pretty girl. Flirt had a lot to say 🙂 Every picture of her had her mouth wide open. 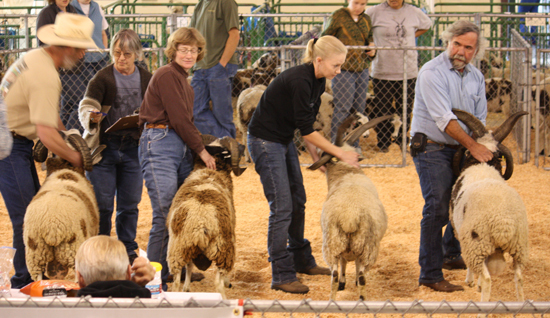 Young flock placements were: 1st – Kenleigh, 2nd – Meridian, 3rd – Mud Ranch, 4th – Swallow Lane, 5th – bide a wee, and 6th – Black Oak Ranch.